Please Obama quit playing the blame game. My friends and I need help now. Is this all there is to life? It is time for Slow Show Obama to stand up and take responsibility for the office he holds. Since the beginning of his term we have seen his legacy unfold before us. Government run health care, out of control spending, Cap and Trade, over 9% unemployment, immigration reform, pork and bribes, sealed documents... The list goes on and on. When does the whining, crying and blame game end? Let's hope for the sake of our country we will see this in 2012. As the deep water disaster unfolds before us our leader waited 30 days before deciding to respond. Our gulf Coast waters continue to grow with the deadly pollution being extricated from BP's rig. Shoving his head in the sand Obama waits for BP to take care of the problem. He stops Louisiana from building berms which could soak up the oil and possibly save the marsh lands. Obama along with BP continue to show their arrogance by not listening to the public or the State Leaders. As he scrambles before the primaries to divert the attention away from the oil by giving pep talks about how great his health care bill is, the residents of La. continue to feel the economic impact. Marsh Island woke up Tuesday to see their beaches covered with oily pelicans trying to fly or even walk. Dolphins could be seen in the oil as they tried to come up for air. One man reported seeing a dolphin come up and brown oil spewed from his blow hole. 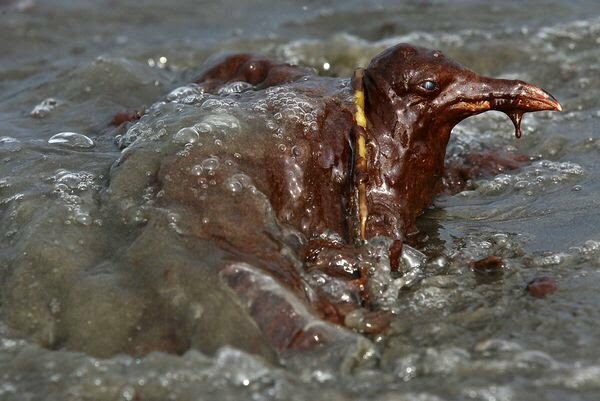 A seagull was spotted still in the water covered in oil with only his head protruding above the muck as he breathed his last few breaths of life. A turtle clinging to a rock covered in oil had no where to go. He could be one of the lucky ones caught in time to save. This is an outrage against free thinking Americans. Listen to what the people are trying to tell you Obama. We are all not as ignorant as you think. For years Americans have opened doors which have solved many problems. 52 days ago we should have been working on this problem together, It Is The American Way! Obama, if you do not have the guts or the knowledge to run this country then get the hell out of the way! There are many people who can knuckle up and do the job. You might consider asking Bush for some help. It is time to stop the oil and the Bull S--- flowing from our ocean and White House. Become a man Obama stop playing the blame game.